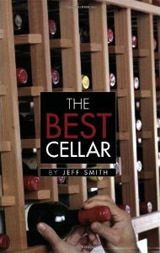 Jeff Smith, creator of the Carte du Vin wine cellar management system gives away all the secrets of the trade in this amusing wine book that is partially a how-to guide for creating the best wine cellar and partially a memoir of his time in client’s cellars. The Best Cellar is at its heart an unpretentious guide to creating the best cellar for you; whether that includes cases of the most expensive labels and vintages in the world or is a more modest collection built around your own personal favorites. He is inherently practical in the information given. The novice collector will also learn about the basics of temperature and humidity as well as the more advanced architecture strategies. He even goes so far as to teach you how to use excel and create your own inventory system based on his Carte du Vin system. The writing style is extremely entertaining and at times laugh out loud. He waxes poetic about how collecting wine is like managing a professional baseball team, the different types of collectors (The Point Man & The Fetishist are two examples) and his eccentric multi-millionaire clients. It’s these asides and interludes that make a potentially boring subject (one whole chapter on excel) enjoyable to read cover to cover. Highly recommended wine book for anyone with an interest in developing a wine cellar or improving the management of their current one.